Step 1 Soak about 10 small wooden skewers in water for 30 mins or so. Step 2 Place brussels sprouts in a mixing bow and heat in microwave for 2 mins. Let cool enough before handling. Step 3 To the brussels sprouts add olive oil, lemon juice, and minced garlic. Season with salt, pepper, smoked paprika, and pinch crushed red pepper flakes. Toss to combine. Step 4 Now thread 3 to 4 brussels sprouts halves on each skewer (keep the stems facing the same direction). Step 5 Heat indoor grill or griddle like this one over medium-high heat (or an outdoor grill over medium heat). Arrange skewers in one layer on heated grill. Cover and cook for 4 mins on one side (or until nicely charred), then, using a pair of tongs, turn skewers over and cook on the other side another 3 to 4 mins or so (covered). Step 6 Transfer grilled brussels sprouts skewers to a serving platter. Squeeze a little bit more fresh lemon juice and sprinkle Parmesan cheese. Enjoy! I’m fond of any recipe that can function in multiple ways: snack, appetizer, or a healthier weeknight side. 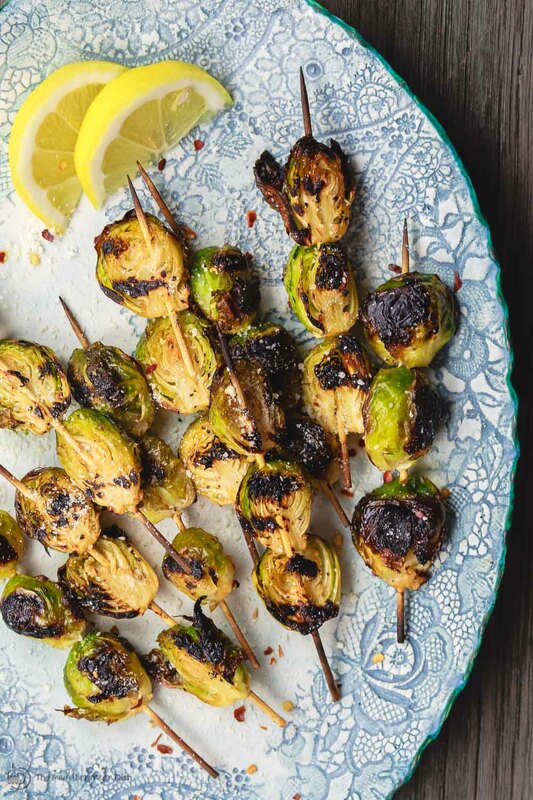 This grilled Brussels sprouts recipe absolutely fits the bill here. Quickly marinated, Mediterranean-style, then perfectly charred, and finished with a sprinkle of Parmesan.